A research balloon launched in December of 2010 from McMurdo Station in Antarctica (below), as a test run ay 112,000 feet for launches in 2013 and 2014 of 20 such balloons to float in the circular wind patterns above the South Pole. Each balloon will help track electrons from space that are an integral part of the turbulent magnetic space weather system that extends from the sun to Earth. 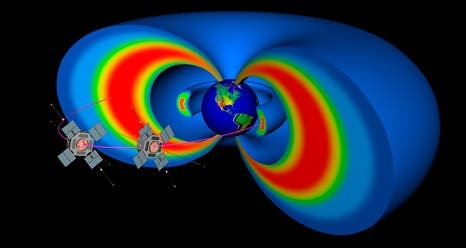 NASA's Radiation Belt Space Probes (RBSP) mission includes two spacecraft due to launch in 2012 to study a mysterious part of Earth's magnetic environs called the Van Allen radiation belts. The radiation belts are made up of two regions, each one a gigantic donut of protons and electrons that surrounds Earth. "We're both looking at the loss of particles from the radiation belts," says Robyn Millan, a professor at Dartmouth College, is the principal investigator for a project called BARREL, or Balloon Array for RBSP Relativistic Electron Losses. Millan's proposal will work hand in hand with NASA's Radiation Belt Space Probes mission. "RBSP sits in space near the equatorial plane and looks at the particles along magnetic field lines there. These particles come into our atmosphere – following magnetic field lines to their base at the Poles – and produce X-rays. BARREL measures those X-rays. Together we can combine measurements of the same set of particles." This rain of electrons within the radiation belts can damage sensitive electronics on spacecraft like those used for global positioning systems and communications, and can injure humans in space. Experiments like BARREL and RBSP help us understand the processes and mitigate those risks. "One of RBSP's main challenges will be to differentiate between the hordes of theories that try to explain why the belts wax and wane over time," says David Sibeck, the project scientist for RBSP at Goddard Space Flight Center. "The RBSP spacecraft will be equipped to distinguish between different options, but Millan's balloons have an advantage in one specific area: they can measure particles that break out of the belts and make it all the way to Earth's atmosphere."